For a long time the importance of raising a calf had been underestimated. However, in the recent years the value of a heifer of a calving age 24-27 months with a high lifetime performance is undisputed. Calves are often subject to stress and disease, making a good nutrient and cow-calf management strategy a must. The immune system of calves at birth is somewhat developed but still very immature and digestive problems are common in calves between birth and weaning. Depending on the supply of colostrum and the hygiene status of the calving and rearing pen, calves suffer strongly from bacterial and viral infections leading to morbidity and mortality. 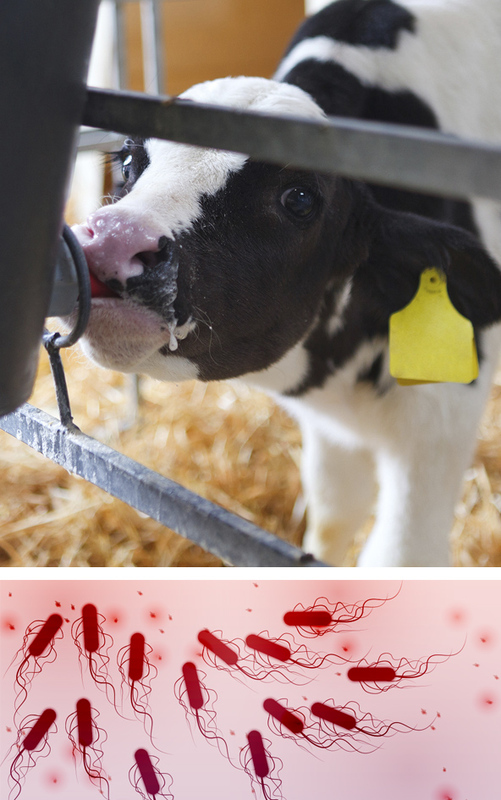 Calf scours or diarrhea can be caused either by milk overfeeding or by bacterial, viral and protozoal infections. Scouring calves can lose 10 to 12% of their body weight in water losses. Health issues in calves mainly manifest themselves in the respiratory and digestive system. The main causes for diarrhea within the initial weeks of life are E. coli, Costridium perfringens and Cryptosporidia. Long lasting effects of calf health problems are often overseen. Subsequently the performance of dairy heifers is reduced, leading to extended periods of calving and reduced milk production with important economic losses. The standard procedure is antibiotic treatment, which is often not appropriate or comes into play too late or is too short. Innovad has developed solutions to reduce medication usage, overcome issues with diarrhea and secure healthy growth in both rearing and veal calves situations. Have a look at the solutions below to learn how Innovad helps calves get through the first months of life.